US suicide rates spiked in the months after Robin Williams killed himself in 2014, according to researchers. In the five months after the actor's death there were 10% more suicides than might be expected, or 1,841 extra cases, PLOS One journal reports. The potential risk of copycat incidents after celebrity cases is known to public health bodies. It cannot be known for certain if his death led to the spike but it appeared to be connected, the new study said. Experts say "irresponsible" media coverage of suicides can play a big part in copycat cases. 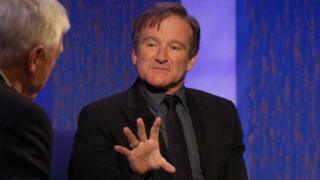 Williams, who starred in films such as Good Morning, Vietnam and Good Will Hunting, was found dead in August 2014. At the time of his death, the Samaritans warned about a large number of news articles giving too much detail about the nature of his suicide, against media guidelines. Guidance from the World Health Organization, the Independent Press Standards Organisation's editors' code of practice, the Ofcom broadcasting code and the BBC's editorial guidelines all advise against going into explicit detail about the methods used. However, researchers said there was "substantial evidence" that many media outlets had tended to deviate from these guidelines. For the latest study, they looked at the monthly suicide rates from the US government Centers for Disease Control and Prevention between January 1999 and December 2015 to see if there had been a spike. They found there were 18,690 suicides between August and December 2014 compared with the 16,849 cases they would have expected. In the weeks after Williams's death, there was a "drastic" increase in references to suicide and death in news media reports, as well as more posts on an internet suicide forum researchers monitored, the study found. David Fink, one of the study's authors, from Columbia University Mailman School of Public Health, said research had previously shown that suicide rates increased following a high-profile celebrity suicide, but this was a first time such a study had been done within the era of the 24-hour news cycle. He told the BBC: "By other people being aware of this person that they saw and can relate to having this experience, they gained the ability to take this action that otherwise wouldn't have been possible. "That is where the press comes in. "The more people hear and learn about the specific details of it, the more they can relate to it, potentially." The researchers said it was possible another event also capable of increasing suicide rates had occurred during the same period as Williams's death but "unlikely". Last year, Netflix added an extra warning to a TV series called 13 Reasons Why amid concerns that viewers might copy its depiction of suicide. Lorna Fraser, from the Samaritans' media advisory service, said: "This study builds on a strong body of research evidence that shows that irresponsible or overly detailed depictions of suicide can have a devastating impact. "In the case of celebrities, the potential for someone at risk to make an emotional connection and over-identify with them is greater, in some cases even to interpret their death as affirmation that they could take their own life." The influence celebrities can have on the public, whether positive or negative, should not be underestimated, said Robert Music, chief executive of Jo's Cervical Cancer Trust. When British reality TV star Jade Goody was diagnosed with cervical cancer, in 2008, and died, in 2009, research showed about an extra 400,000 women attended cervical screening appointments. Goody had spoken out publicly about her disease and the importance of screening. Mr Music said the "Jade Goody" effect had since faded and screening attendance in England was now at a 20-year low.